I’ve been reading a book by Glenn Adamson, “Thinking Through Craft,” in which he grapples with the question of the difference, if any, between art and craft. Unfortunately, there is a difference, at least in the minds of the High Art world. Craft is somehow not only different from but inferior to art, in these minds, and those of us who work in the “craft” mediums such as ceramics, glass, wood and fiber have a hard time being regarded as “real artists” in the way that painters and sculptors are. Adamson writes about the discipline of ceramics shortly after mid-century. You might want to substitute “fiber” for “ceramics” and see if the discussion rings true. Adamson continues: “It was from this attitude that Process Art, the most craft-like of the twentieth-century avant gardes, was born…. If Morris was a sculptor who did not want to make a modern sculpture, then the story of ceramics is primarily that of potters who did not want to make pottery. Of course, both of these efforts were doomed to failure. Ceramics, defined as such, could only continue to be ceramics, and for the most part, those who work with clay have remained identified as craftspeople rather than contemporary artists. Process Artists, meanwhile, despite their seeming attempts not to, made modern art objects that were revered as sculpture. 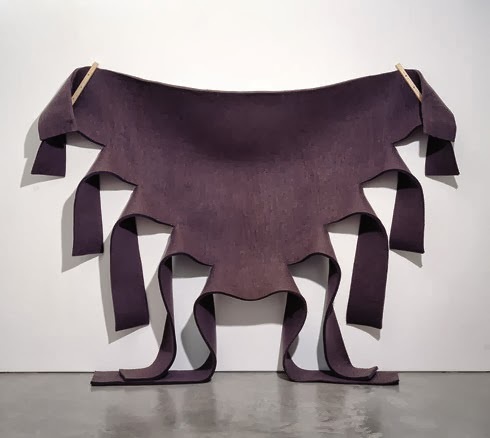 Interestingly, Morris tried to claw his way out not just with plywood but with fiber, making many works out of draped or piled felt that were regarded as sculpture, just as the first generation of “fiber artists” were trying to claw their own way in to being regarded as sculpture. And yet the High Art world does this all the time, arbitrarily awarding designations that are difficult to escape. Get your MFA from Yale as a painter, and you can subsequently have as many New York gallery shows as you want in whatever medium and technique you choose. Make quilts, if that’s what floats your boat, but make sure you aren’t too meticulous about the craft techniques. You might even want to have your mom do the actual sewing. On the other hand, start out making quilts for your bed or your children, and become so accomplished that your work comes off the bed and onto the wall, and is aesthetically stunning, but you’ll never get that New York gallery show, even if your quilts look just like the guy’s in the previous paragraph. Or far more likely, even if your quilts look a whole lot better than the guy’s in the previous paragraph. thanks for the daily chuckle, Kathy…..
and let’s not overlook that the operative word is likely ‘guy’……..